Back in summer 2017, Movement Mortgage’s CEO purchased the last black-owned bank in Virginia with plans to turn it into Movement Bank. He vowed to shareholders and the community that the bank’s proud, storied legacy would be preserved even though the name and leadership would change. This storytelling project was a fulfillment of that promise. Along with two video producers, I spent a few days in Danville, Va., interviewing the people whose pasts are inextricably linked to First State Bank at its prime. I also combed through archives at the University of Virginia in Charlottesville to find bank records so I could accurately write the bank’s story. Go here to watch the videos and check out the story on Movement Bank’s website. In 1919, if you lived in Danville, Va., you could be sure of three things: You would be born in a segregated hospital, educated in a segregated school system, buried in a segregated cemetery. And if you were black in this small southern town dominated by textiles and tobacco, you could add this to the list: There was no place to deposit your money, no accounts to save your cash, no way to obtain a loan. No access. No opportunity. No bank. That is, until 21 black doctors, teachers, farmers and preachers started their own bank, our bank, in a church basement. And while its beginnings were humble, this institution became much more than a bank. It was a symbol of economic independence and a totem of black economic resilience in the age of Jim Crow-enforced segregation. It flourished in a southern Virginia town hailed as the last capital of the Confederacy. And it will continue to be a beacon of strength and integrity for its customers for years to come. Though its name has changed, from the Savings Bank of Danville to First State Bank and to Movement Bank today, its mission is the same: to love and value people, to serve those who have been marginalized and mistreated and to lead a Movement of Change in this industry, corporate culture and our communities. In our early years, First State Bank provided a financial footprint for its black customers. It powered Danville’s black economy, becoming a launchpad for entrepreneurs needing startup capital for their businesses. It underpinned the town’s faith community, financing dozens of black churches. And in 1963, it played a pivotal role in the civil rights movement when it paid the bonds for nearly two dozen demonstrators jailed for protesting segregation. It’s unclear who exactly came up with the idea to create a black-owned bank in Danville, but we do know the identity of the man who made it a reality. The Rev. Samuel Moses, who pastored a local Baptist church, sold $10,000 of stock to 200 shareholders to get the bank off the ground. With his team of 20, he raised $6,500 for the bank’s capital and surplus fund. The group organized a board of directors, elected a president and, on Sept. 8, 1919, opened The Savings Bank of Danville. By the end of 1920, our bank had nearly $1 million in assets; three years later, it purchased its current downtown headquarters for $40,000. During the Great Depression, our bank was one of the first to reopen after all banks were forced to close their doors in 1933. And in 1934 we became one of the first banks in Virginia to issue Federal Housing Administration (FHA) loans, helping lower income citizens become homeowners. The bank changed its name to First State Bank in 1953 and continued to maintain strong capital ratios, keep bank expenditures low and intervene the day racial violence rocked Danville. Hazel York grew up drinking “colored” water. She went to “colored” bathrooms. “Colored” parks. A “colored” school. That was most southern towns in the 1920s. And in the 1930s. The 40s. The 50s. The 60s. At a time when blacks were denied most basic rights, this bank granted access to people who needed homes, pastors who needed churches and farmers who needed loans to purchase and plant tobacco. 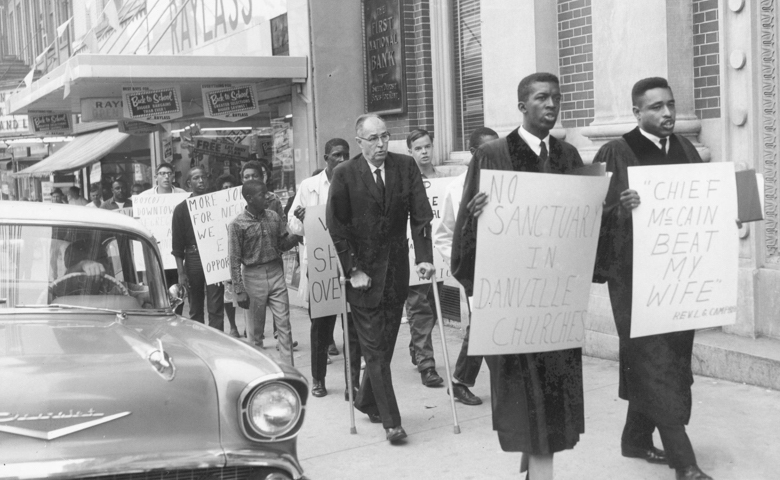 But change was on the horizon in Danville in the summer of 1963 when a visit from Dr. Martin Luther King Jr. inspired students, clergy and activists to unite in protest. They formed the Danville Progressive Christian Association (DPCA), an affiliate of King’s Southern Christian Leadership Council, and led marches that blocked traffic and occupied municipal buildings. On June 10, protesters marched to the municipal building. Authorities blasted them with water from fire hoses. Police beat some of them with clubs before making arrests. That night, 65 citizens walked from Bibleway Church and encircled the town jail, singing hymns and kneeling in prayer. Police and deputized sanitation workers bearing fire hoses and billy clubs entrapped them. Nearly 50 demonstrators were seriously injured in the fray. The event was called “Bloody Monday,” a pivotal moment that brought Danville national attention. It also caught our bank’s attention. First State Bank’s leadership liberated 18 jailed demonstrators by posting 32 cash bonds ranging from $100 to $1,000. M.C. Martin, the bank’s president at the time, put up a $20,000 building he owned downtown as bond security for three DPCA leaders. Bishop Lawrence Campbell has lived in Danville for more than 60 years. He remembers when the town was deeply divided along skin color, and he remembers the moment Danville embraced integration. Most of all, he remembers First State Bank as a source of pride for the town’s black population and an integral player in the fight for racial equality. Campbell has witnessed the bank’s transformation over the years. He’s hopeful new investment and fresh vision will create a bright future. For 98 years, our bank has stood for progress in the face of systemic resistance. Our next chapter will build on this legacy. Just like it did when it was called First State Bank, Movement Bank will strive to right many of the wrongs in the financial system. Change. That’s the heartbeat of our bank. That’s what we hope to bring to the financial services sector. That’s what we want our customers to expect from us. Want a quilt woven with 'cupcakes and confetti'? She's giving hers away. All Cheryl Turner Center City Church Jon's Copywriting Why do millennials matter? Featuring You Barbershop The Wigfall Love Story National Sales Support Center Pets, smokes & neighborhood blokes Alphabet Soup Misc. Cheryl Turner Center City Church Jon's Copywriting Why do millennials matter? Featuring You Barbershop The Wigfall Love Story National Sales Support Center Pets, smokes & neighborhood blokes Alphabet Soup Misc.